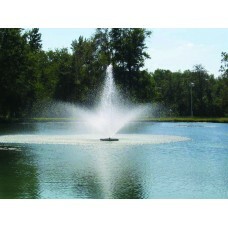 Multiple spray nozzles with each fountain allows you to change the look of your fountain as desired. These fountains improve the health of your water with increased oxygen transfer. These floating fountains are designed and built to deliver reliable and efficient performance, meaning lower long term operating costs. They are corrosion resistant and have a water-deflecting nozzle to prevent clogging. Fountains come with motor, float, 50' power cord, control panel (with timer/GFI) and mooring ropes. Power cord includes quick connect on all but 3/4 HP. 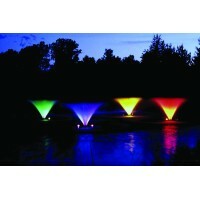 Give your decorative fountain a colorful night time display! These color changing lights will ..